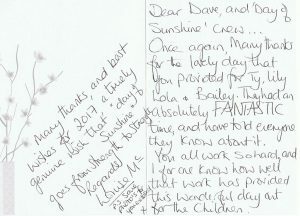 A Day of Sunshine is a Lancashire based children’s charity aiming to bring a little sunshine into the lives of local deserving children, by providing them, and their families, with an all expenses paid holiday either in Spain or the UK. Funding for these holidays is raised by selling unwanted, donated clothing and household items in our shop in Lytham St Anne’s, public donations, and fundraising events in the Blackpool area, and all profits will go towards providing a holiday for a deserving family! Registered Charity No. 1149764 Day of Sunshine (UK) Ltd.
We believe that every child deserves to smile and with your help and support we can provide special day trips, holidays and other services. Our charity is aimed at disadvantaged/mentally and physically challenged children and their parents/carers. For the majority of our guests, their holiday destination is La Casa Rosa, a large, four bedroom detached villa, in the sunny Andalucia region of Southern Spain, which, thanks to a generous donation, has been secured by us for a peppercorn rent, on a five year lease, with the option of a further five years at the end of this period. However, for any of our guests who are unable, or prefer not to travel to Spain, for any reason, we are now delighted to now offer the option of holidays at selected holiday parks in the UK! Donate to A Day of Sunshine. 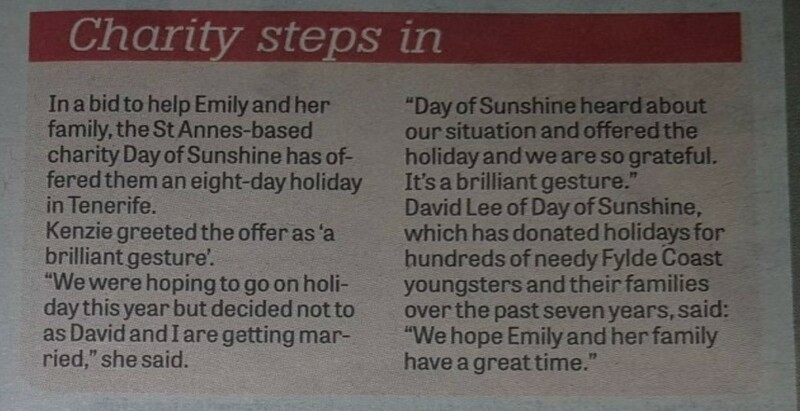 At A Day of Sunshine children’s charity, we are entirely dependant on the generosity of the general public to help us to continue to provide much needed holidays for deserving children. If you would like to help both us, and a child, please donate either cash, or goods, using the buttons below. 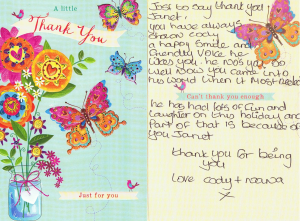 Your donation will help someone, who may otherwise not have the chance, to enjoy a well deserved holiday! Join the elves as we welcome you on the annual visit to the north pole. You`ll be flying in style from Leeds / Bradford International Airport. 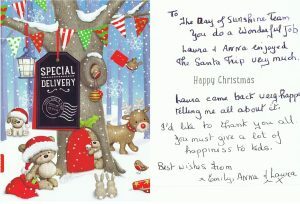 Each boy and girl will receive a special Christmas gift from Santa himself!